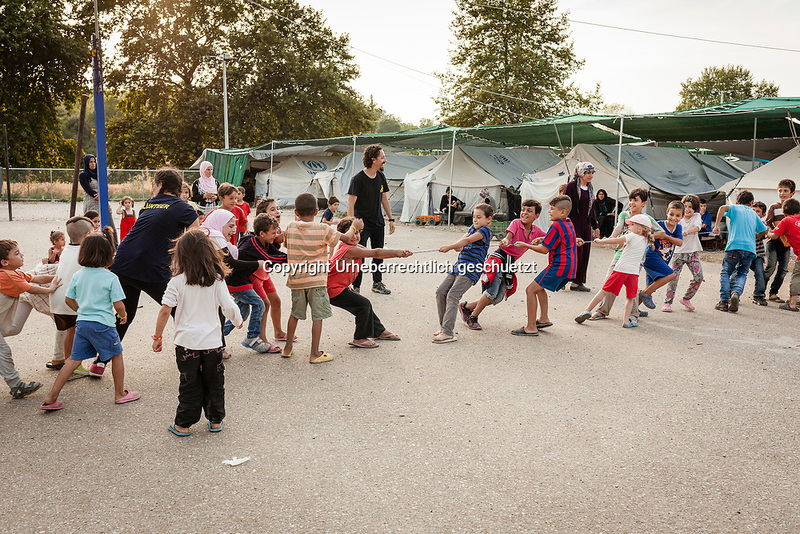 Greece, Lagkadikia, "Jafra Team in Greece Refugees to Refugees", playing the children, together with spanish volunteers. Here the play Tug of War. Haifa (2 L, with pink scarf) is watching like many other women to their kids enjoying the game in the late afternoon. Sahin, age 9, (6R, with blue T-shirt and pans) having fun. Its a little entertainment in the daily life inside the camp. Jafra Foundation for Relief and Youth Development (Jafra) is a non-partisan, secular, community-based organization based in Damascus, Damascus Governorate, and Homs, Homs Governorate. Refugee from Syria trapped in Greece started to work in Idomeni as a Jafra Team and continue there work now in the camp.